ANTONÍN REICHENAUER (c.1694-1730): Bassoon Concertos in C & in G Minor, Violin Concerto in C Minor, Oboe Concerto in G, Concerto in B Flat for Oboe and Bassoon, Overture in B Flat for 2 Oboes, Bassoon, Strings and Continuo. 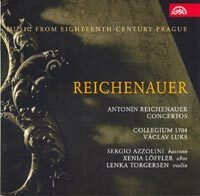 Description: World premiere recordings of works by this extremely talented but unfortunately short-lived Czech composer. All of his instrumental music survives only in Germany (mostly in Dresden) but he probably composed it for Count Morzin's orchestra, in which he played. The C major bassoon concerto is highly virtuosic and probably intended for the same player for whom Vivaldi wrote many of his concertos for the instrument. However, the overture-suite may have been intended for Dresden since it ends with a Polonaise (and the Elector of Saxony was, see Zelenka's funeral music for him offered above, also King of Poland). Sergio Azzolini (bassoon), Xenia Löffler (oboe), Lenka Torgersen (violin), Collegium 1704; Václav Luks.